Enter Searenity, a brand new home with calming blue, gold and yellow interiors. The newly crafted home has reclaimed floors, whimsical tile designs and casually elegant furniture. Searenity will provide a tranquil space for your vacation. Park on two pads at the rear of the property. 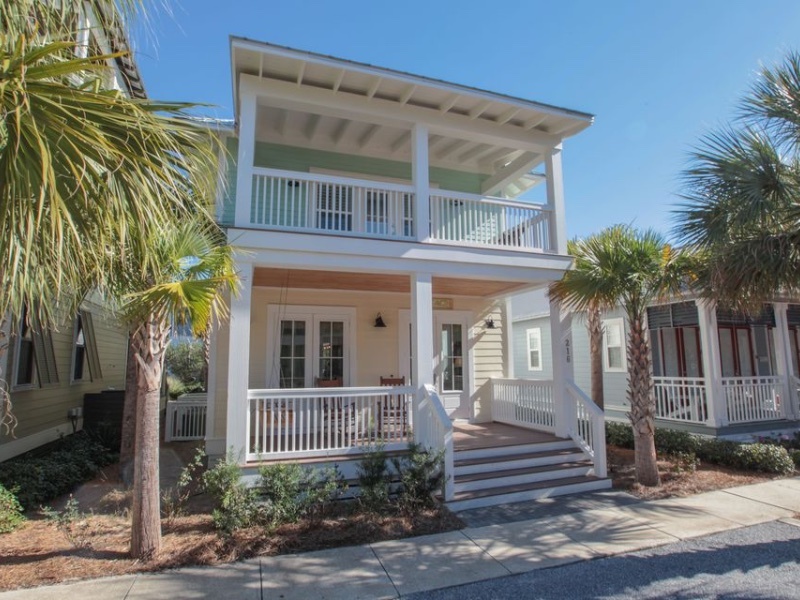 You’ll step up to the porch with rockers and into the kitchen with a four-top island. The lounge connected to the kitchen creates a television or reading center. Up front is the living room with a full sleeper sofa, 48” TV complete with a Sonos sound system controlled by the Sonos app and Apple TV. Dining area with seating for eight. The stairs lead to all of the guest rooms. With a roomy shower, the king master has a balcony great for taking in the balmy night air. The queen and full bunk rooms both have private baths. Opt for walking 10 minutes to the beach or hop on the complimentary shuttle service (runs seasonally). You will pass the centrally located lagoon pool, the highlight of many visitors stay.